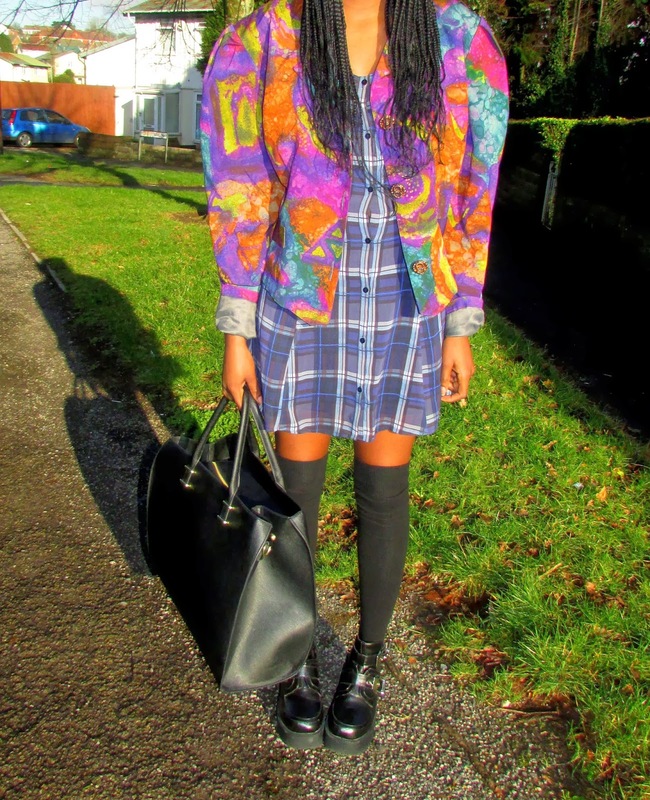 New Look Beret / Thrift 80s Jacket / H&M Dress / Internacionale Knee High Socks / H&M Bag / Ebay Cutout Boots. Whilst my relationship with make up is going down the drain; my fondness for mixing different coloured prints seems to be resurfacing with some major force. Not quite sure what sorcery had taken over me the past couple of days but monochrome had to go. Today, I come at you this 80s inspired ensemble, an outfit thrown together in less than 10 minutes as I was in a bit of a hurry this morning as per usual. There are times when I really do think I was born in the wrong decade; my love for 80s fashion, 80s music and 80s movies is something not even my own mother understands. Besides, the 80s is where all the cool kids hung out. I apologise for the limited photos today, haven't had a lot of time on my hands. Teaming up what I'd say is the best thrift find ever, this print jacket, with a tartan 90s style dress which I purchased from H&M a few days ago and is only just making it's grand debut; it's all about keeping it retro. I finished off my look by throwing on a pair of knee high socks, beret and cutout boots. The sun is out today which is a nice change from the dreary weather, it was only inevitable that I would snap a few in it.